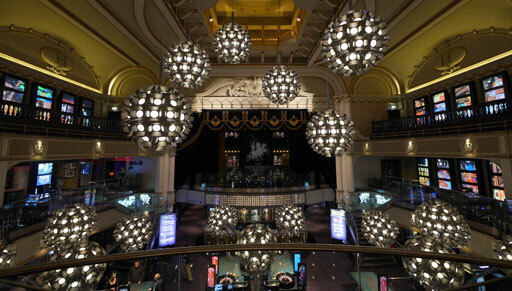 Our original site-specific video installation is still located in the main space of the Hippodrome Casino. 57 independent plasma screens covering 3 walls create an immersive installation experience for viewers on 4 floors. The video installation incorporates all original content layered and blended exploring multiple aspects of the Hippodrome ‘Experience’. Imagery includes London cityscapes mixed with spinning roulette wheels, Las Vegas classic neon and clowns from the Boom & Bang, Hippodrome's resident Cabaret Circus. Animation still from Video Installation - Gaming. Animation still from Video Installation - Vegas Neon. Atrium Casino - From this view plasma screens can be seen on 2 walls.